Book review: "Rules of Vengeance"
This review first appeared in Turbula in August 2009. Standard operating procedure on writing a thriller has been to create a flawed hero, and send him or her up against one or more bad guys. Christopher Reich has added a nice twist to that formula, though, by adding a third role to the equation: the character we can't quite classify as good or bad. 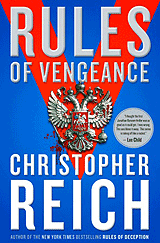 In "Rules of Vengeance," the sequel to 2008's "Rules of Deception," Reich takes the already mysterious Emma Ransom and adds another half-dozen levels of intrigue to her character. In last year's best-selling novel that introduced the series, hero Jonathan Ransom found out that his wife wasn't who he thought she was  but was instead a deeply undercover operative for a secretive U.S. agency. As Jonathan, a straight-arrow surgeon working for a pittance with Doctors Without Borders, has his innocence regarding his wife stripped away, readers were left nearly as confused as Jonathan about Emma's true character. "Rules of Vengeance" picks up where "Deception" left off, with Jonathan and his now on-the-run wife unable to so much as communicate with one another lest she be found by her former handlers and killed. While in London to speak to a medical conference about his work with refugees in Africa, Jonathan is whisked to an unexpected rendezvous with Emma. While she professes to have missed him, he has his doubts about her true motive for the meeting -- doubts that are confirmed all too tragically when he surreptitiously follows his wife and watches her set off a car bomb in central London, killing innocent bystanders. Jonathan is arrested on the scene and charged with the bombing  only to use his mountaineering skills (which were introduced in the opening of the first book) to escape police custody. It's here the new book really takes off. Reich's description of Jonathan's wild race across Europe to try to find his wife is first-rate, with delicious action sequences and two wonderfully fleshed-out police officers chasing both Jonathan and Emma. The plot twists back on itself so many times that it's easiest to simply give up trying to anticipate the next turn, yet it's all consistent with the characters and circumstances. Elevating this novel above standard thriller material, making it likely to stick in your head weeks after you've set it down, is the combination of byzantine back story for Emma and the lack of easy conclusions (much less closure) for Jonathan. As with Len Deighton's characters of Bernard and Fiona Samson (from the Game-Set-Match and Hook-Line-Sinker trilogies), it's never really clear just where Emma's loyalties lie. Is she a double agent? Triple? Free-lancer working both sides against the middle? Who knows? Perhaps not even Reich himself yet. What is made clear in the closing pages of "Rules of Vengeance" is that we've not heard the last from Jonathan and Emma Ransom.